A pastor at the Divine Yard Deliverance Ministry in Iyana Iyesi, Ota Ogun State, identified as Peace Udoh, has been arrested by the police for allegedly running a baby factory in the church. 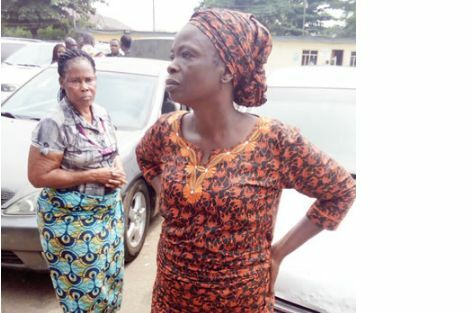 The 47-year-old female pastor was said to have sold 64 babies before she was arrested on Sunday by operatives from the Lagos State Police Command who acted on a tip-off. Madam Udoh was apprehended with one Angela Akpan and a nurse, Mrs. Bukola Ajala, who is said to be assisting in childbirth at Pastor Udoh’s church. It was learnt by Punch that the pastor usually referred complicated cases to the nurse, whose clinic – El Shaddai Hospital – is located a few metres away from the church. It was gathered that Angela’s younger sister, 17-year-old Goodnews Akpan, recently gave birth to a child at the clinic too. Angela, who was arrested on Saturday in the Sango area, was said to have led police operatives on Sunday to Pastor Udoh’s church and Ajala’s clinic, where they were picked up respectively. While parading the suspects on Monday at the Lagos State Police Command headquarters in Ikeja, the Commissioner of Police, Fatai Owoseni, said detectives swooped on the syndicate after receiving intelligence report that Pastor Udoh needed a buyer for Goodnews’ baby. “The suspects run a baby factory in the Sango Ota area. We are still working to get 64 other children she has sold out,” the CP added. But the female pastor, who hails from Akwa Ibom State, refuted the allegation, saying she used the church as a maternity home to assist her pregnant church members for a token. She said, “I have been a pastor for 13 years. I only assisted my church members during childbirth. I take delivery of 13 to 15 babies every year and I have handled over 60 cases so far. I don’t sell the babies. Ajala, the nurse, said she collected between N15,000 and N17,000 for each child delivery, adding that she didn’t know anything about selling of babies. Goodnews, a secondary school dropout, told Punch that she was not aware of the plan to sell her baby. She said she followed Angela to Lagos to avoid being ridiculed in the village. “I got pregnant in the school but none of my boyfriends was willing to take the responsibility for the pregnancy. “My mother would not allow me stay with her so I decided to follow my sister to Lagos,” she added.